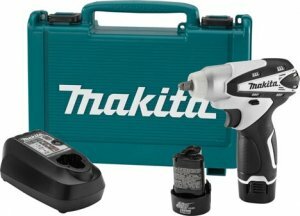 Makita has added yet another tool to their ultra compact line. Makita's new entry to their line is the Model WT01 3/8-inch Impact Wrench. These are a little less common then your standard impact driver, but they have the same general function. The advantage of the impact wrench is its ability to handle sockets without the need for adapters. The WT01 offers 1,000 in.lbs. of torque in a tool that is only 6-3/8" long and weights only 2.1 lbs. The impact wrench uses a Makita-built motor that provides veritable speeds of 0-2,300 RPM's and 0-3,000 IPM's. The WT01 also sports a built in LED. The 3/8-inch Impact Wrench can be purchased as a kit (WT01W) which includes two 12V max Lithium-Ion Batteries, Charger, and Tool Case. A 3-piece kit (LCT309W ) is also available, and includes the 3/8" Impact Wrench (WT01), the 3/8" Driver-Drill (FD02), L.E.D. Flashlight (LM01), two 12V max Lithium-Ion Batteries, Charger, and Tool Case.